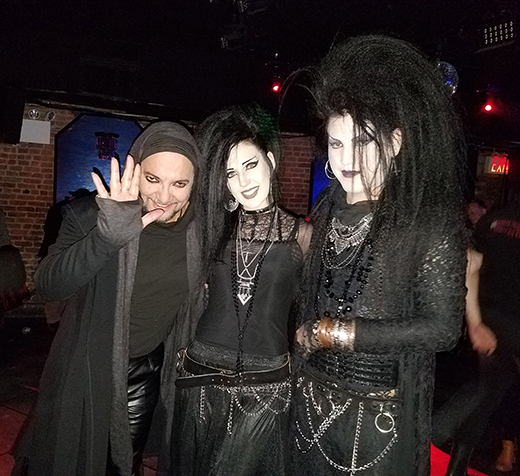 Jeff Ward, leading impresario in NYC’s dark dance club scene, introduced another specialty night on Friday February 10 at Windfall, holding what he termed ” A Tribute to the Cure” night. When we heard “Charlotte Sometimes” coming from the P.A., we knew we were in the right place. The night featured Cure and Cure-era tunes to dance to and a plethora of seemingly endless Cure videos running silently on a video screen mounted above the bar. 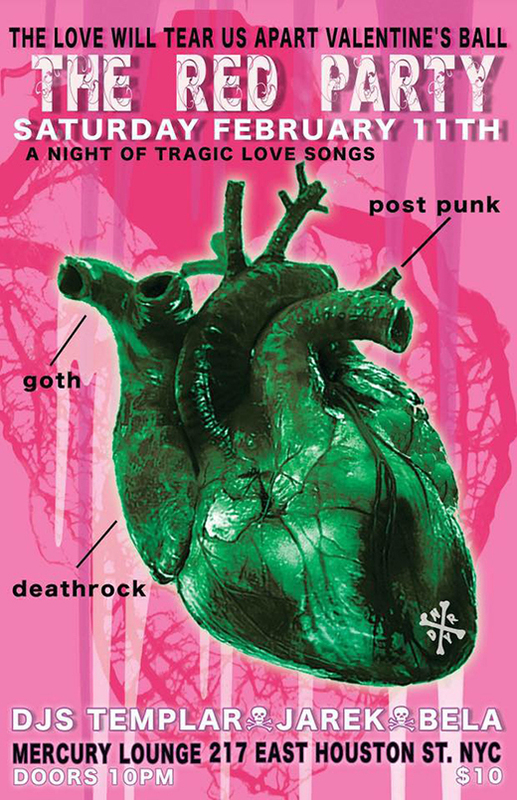 Nothing says Goth like The Cure! 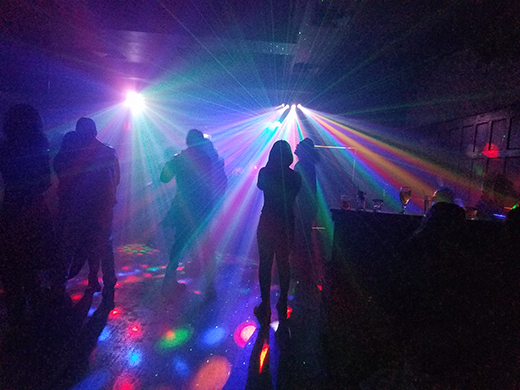 Another event held the same night was DJs Eisdriver and Arsenal’s third installment of their much-acclaimed “old-school EBM” session, BodyLab. It was again held at the Parkside Lounge with what seems to be an enlarging crowd. Once again, Wendy Blackwidow was present, although we didn’t stick around long enough to know if she deejayed. Grainy archival music videos flickered on the wall, as on previous occasions, enhancing the atmosphere of a stripped down, industrial music world. 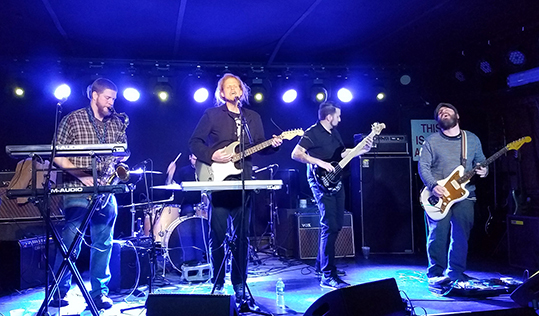 A Valentine’s Weekend edition of Sean Templar’s The Red Party was held Feb 11 at the usual digs, The Mercury Lounge on Manhattan’s East Houston Street adjacent o the former New Wave nightclub, The Bank. Door opened for the event at around 11 pm, and Sean Templar greeted comers at the entrance to the dance floor right at the end of the long barroom. Near the entrance, Rusted Autumn had set up a merchandise stand where they sold handcrafted Steampunk, Neo-Victorian, jewelry and mystical knitwear fashions with a Gothic flair. Patrick Cusack, Mandana Banshee and Jennifer Bobbe were among the scene regulars in attendance. Also present was the crew from Haunt Hunters, a group that attends, samples and evaluates all kinds of haunted attractions and entertainments, even off the Halloween season. Sean quickly joined guest deejay Alex “Bela Lugosi” Zamora at the turntables. 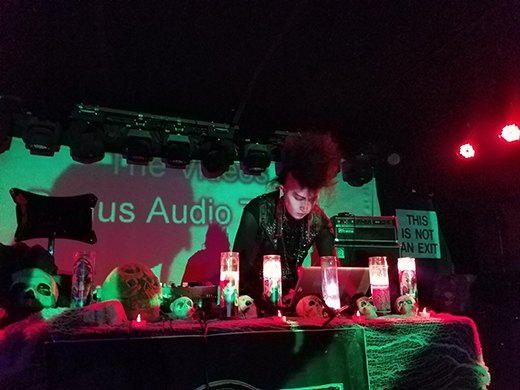 Alex brings a unique mix to the musical scene, having grown up outside The States and having acquired a truly eclectic repertoire of darkwave and deathrock music. Issuing forth from his controls to the ( at times too loud) public address system were rarities and oddities like “Drinking Blood” by the Juggernauts, “Black Roses” by Advanced Art and an especially catchy, danceable track, “Eternal Torture” by Athamay. When Jarek “Raven” Zelazny took over the mix, we heard Sisters of Mercy’s “Heartland” and Siouxsie’s “The Passenger”, plus the wonderful “Do You Love Me?” belted out by Nick Cave. 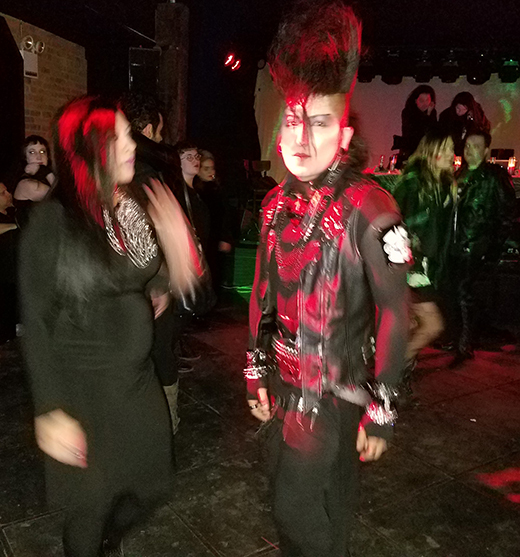 The dance floor was well populated much of the time, but never as beautifully as when the elegantly attired diva, Luna Pallida arrived and was joined by supergoths Valefar Malefic and Jorge Obando. When celebrity DJ Alex took the dance floor with his beautiful other half, CatGirl Morales, they were hit by a beam of red floodlight, causing them to appeared spattered, appropriately, with blood. Readers can easily look up earlier reviews of The Red Party for recurring details on earlier issues of this paper or on www.doktorjohn.com. On Feb 19 Aunt Ange, the incredibly creative, eccentric and, for want of a better word, gothic/steampunk band on which we have reported previously, performed a Sunday night show at the Mercury Lounge that brought in a diverse crowd of fans and followers from the greater NYC area, NJ and as far away as Pennsylvania. The IFC Theater on Avenue of the Americas in Manhattan’s West Village held a program of 2017’s Short Films, and one of the entries was “Animations.” These top picks are intensely entertaining every year, and this year was no exception. Besides enjoying the brilliant and creative art per se, it seems the genre lends itself to unique and curious themes. The Academy Award winner was of course, a cutesy, photo-realistic cartoon from powerhouse Disney’s Pixar, called “Piper” about a sandpiper chick. It was difficult for studios with less resources to compete, although I wish there could have been more recognition for those that presented rather more radical themes and innovative, less conventional techniques.. One such, “Once Upon a Line” is without dialogue, and consists of minimalistic line drawings that tell a story about a daily routine being discombobulated by romance and is as engaging as any Rock Hudson/Doris Day feature film. 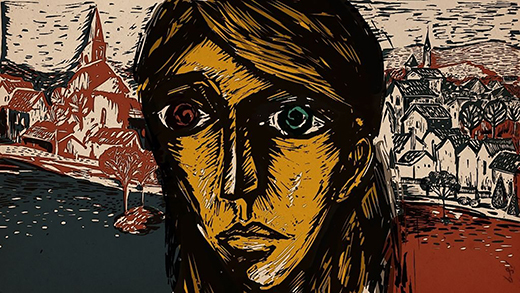 “Blind Vaysha” has an interesting look, like a series of wood-cut prints have come alive, and tells a rather creepy Russian fairy-tale. “Pearl” is a brief synopsis of a little girl who grows up to be a folk-rocker. The real star is adult-themed “Pear Cider and Cigarettes,” about the true-to-life rises and falls of a daredevil young man as he descends into self-destructive adulthood, narcissism and addiction. So harsh was this particular 35-minute film that it was held to the end of the program at which point parents were asked to remove underage viewers – and thank goodness they did. The artists meet the challenge of portraying the many and gruesome encounters of the subject with drugs, alcohol, violence and a hospital in China. It is highly recommended for the narrative as well as the ingenious animation artwork. Mark Sinnis & 825 at Sue’s Sunset House, Peekskill, N.Y.
On February 18 singer-songwriter Mark Sinnis returned to Peekskill, N.Y from his new location in North Carolina to join with his band, 825 for a nearly 3-hour marathon performance of their signature “Cemetery & Western” repertoire at Sue’s Sunset House, a comfy and fitting venue with a bar and an excellent menu. About 35 or so enthusiastic fans packed the place, among whom was NY/NJ music patrician, George Grant, noted producer for Sinnis and many others in the NY area. About a year ago, Sinnis relocated his famous Beale Street Barber Shop from Peekskill to Wilmington, N.C. It’s best described as an antique-styled barbershop with a museum-like collection of memorabilia and artifacts recalling the early days of rock’n’roll, with an emphasis on country music and with a shrine to Elvis and other pioneers of the genre. It also serves as an art gallery with rotating exhibits. The band is usually 8 members, but one fiddler was missing this night. It must be tough, indeed, to coordinate between his home in North Carolina, and his accompanists who live in upstate New York. Sinnis has led a resurgence of the venerable tradition of linking classic country & western music to pitch-black, gloomy themes. Thus the opening piece, his fast-paced “Undertaker in My Rearview Mirror,” set the stage for much of what was to come. 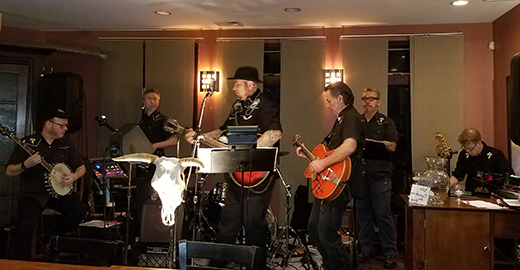 Following “Undertaker,” they launched into “Long, Cold, Hard, Lonely Winter,” a minor-key threnody that’s accented by dual trumpeters who imbued it with a Mariachi band flavor. The next piece was a nostalgic, 60s-era stroll, and was followed by “Sunday Morning Train,” this time in a major key, and for which one of the trumpeters switched to a pedal steel guitar with great effect. It also afforded the banjo and the drummer opportunities for virtuoso solos. 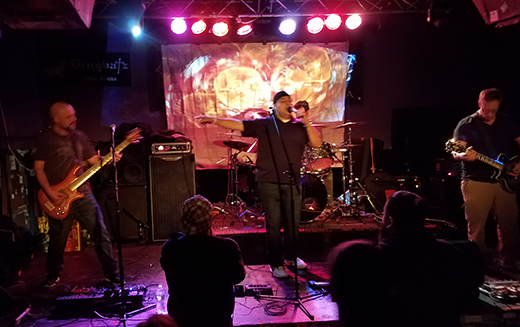 The show ended with the verbosely-titled “I’ll Have Another Drink of Whiskey ‘Cause Death Is Not So Far Away.” It is reassuring that Sinnis’ relocation to North Carolina doesn’t mean that the greater New York area will be permanently deprived of his performances, both in concert with 825 and – hopefully someday – his alternative gothrock band, Ninth House. The Center for Italian Modern Art, a non-profit academic art operation located on the 4th floor of 421 Broome St, and hosts small, intimate but highly significant exhibitions and offers opportunities for scholars as well as symposia for the public. They’re presently hosting a dual-artist exhibit featuring iconic, original paintings of metaphysical artist, Giorgio de Chirico; and the de Chirico-inspired, derivative works of Giulio Paolini. The latter is a graphic designer and photographer who took images from the senior artist’s iconic works and collaged them into composite mixed media works. 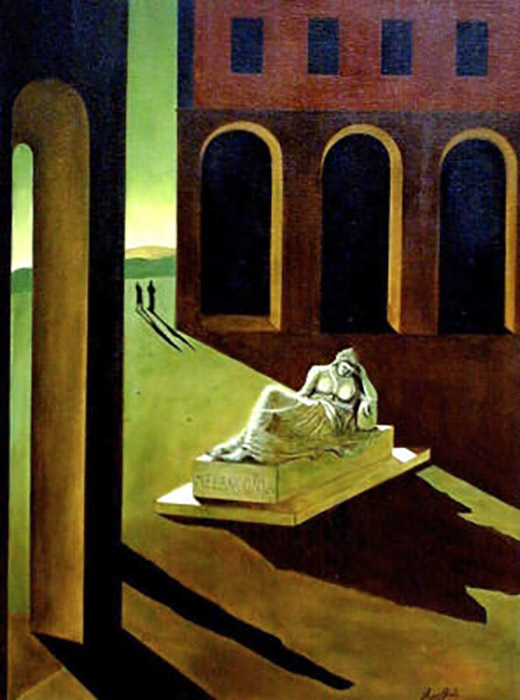 I think everybody recognizes “The Disquieting Muses,” (1916) de Chirico’s desolate, fantasy landscape painted in Ferrara, Italy during World War I, with its faceless, egg-headed foreground figures and the long, melancholy shadows that the figures and objects throw. It inspired poems and books to take its title. It is amazing that a tiny, but prestigious institution such at CIMA has the actual original of this 20th century icon, not one of the dozens of duplicates that the artist painted for commercial sale. 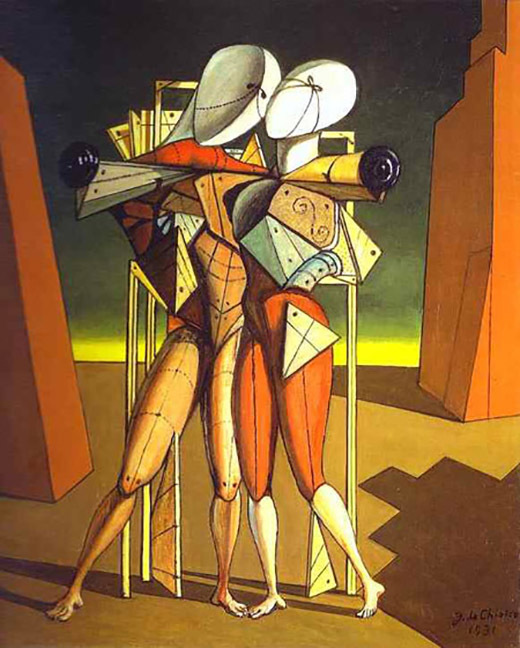 De Chirico said he was painting the metaphysical reality beyond our everyday perceptions. He churned out some spectacular paintings to haunt our collective psyches. Shopping for an idea for a really unique and attractive tattoo? 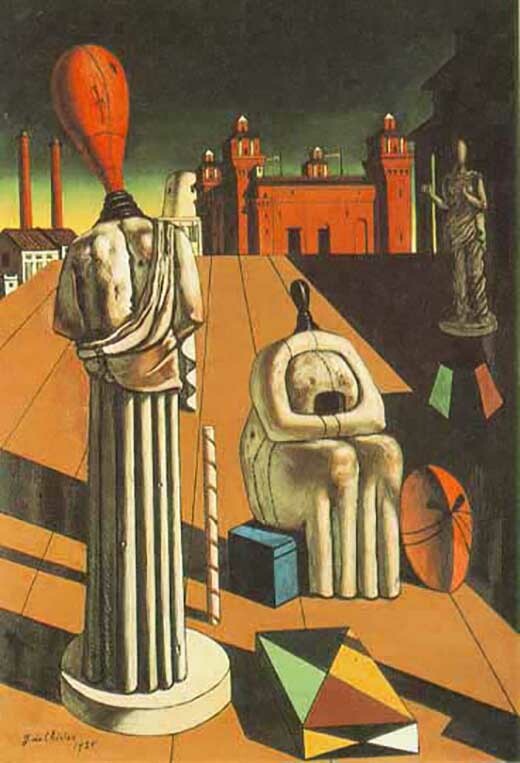 I’d search the net for images of de Chirico’s works from 1912 to about 1920, but not later. They are the stuff of dream-visions, but he kind of lost his inspiration around then, and the rest of his work isn’t so hot. I am pleased to report that on Feb 17, the followers of Memento Mori received the joyous news that the stunning hostess, Catgirl Morales and multi-talented photographer DJ Bela Lugosi Alex entered a lifelong commitment in a small, intimate, but beautiful setting thanks to the groom’s and his best man’s skill at decor. Here are some shots of the happy couple and their celebratory entourage of family and friends. Doktor John and all at New Dark Age extend congratulations and very best wishes to a beautiful couple! falls into the second category. There is a certain joy that musicians inevitably feel when they master the works of music that they admire for the songs themselves. They can either focus on the music itself, without paying homage to the antecedent performers; or they can concentrate on just how the original performers interpreted the music. Once again, Moving Units seems to have aimed to lovingly achieve authenticity in both mastery of the songs and of their delivery as conveyed by Joy Division. So, if you were looking for innovative, novel interpretations, this is not the place to look. The main differences are found, not in the instrumental accompaniment nor even the delivery, which is a dutiful copy of the original style, but the timbre of the vocalist vs. that of Ian Curtis. The best justification for producing an album that so diligently repeats the sound and style of Joy Division, but for the particulars of the vocalist’s voice, would seem to me to be to promote their presumably up-and-coming live performances. Thus, the “Collision With Joy Division” is saying, “This is how well we recreate the Joy Division sound. Come see us reproduce the ‘live’ experience.” Indeed, Moving Units is now embarked on a a nationwide tour that runs through March 19. 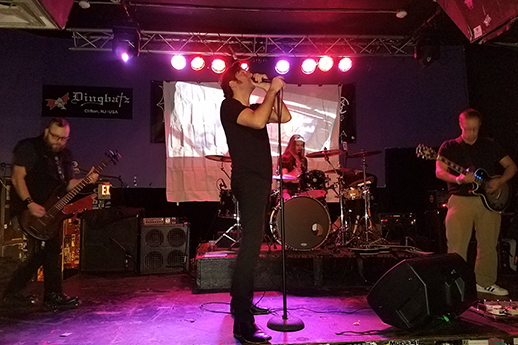 The singer has a different voice and employs slightly more careful pronunciation, even though he manages to imitate most of the inflections and idiosyncrasies of Ian Curtis. The arrangers and the accompanists basically stick to the originals as much as possible, such that if you don’t listen closely to the differences in the vox, you would think you are basically listening to Joy Division. There are more differences between two versions of the same song by Joy Division on different albums than there are between the version offered by Moving Units and the originals. There is something so powerful, so epochal, so classic about these 10 songs of Joy Division, that any version which recapitulates them, however lacking in originality, is always pleasurable and worthwhile. This is a self-named, self-released debut EP from a NYC-based band that will be available on 7” vinyl, CD, and digital in March 2017. It contains 10 high-energy, old-school, defiant punk tracks with some creative and tongue-in-cheek twists. It opens with a track titled “Entropy,” a classic rant of unfocussed energy. Some of it is jumpy pogo-punk, but there are surprises to delight, such as the appropriation of “Ring around the Rosie” which these kids picked up from the Mr. Softee trucks that toured their neighborhoods in the 70s and 80s. This is on a socially conscious eighth track “Mr. Walton” which addresses the issue of income inequality. The third track, “Ban Rebranding” is a rapid, guitar-backed mantra a critique of organizations that obfuscate their wrongdoing via corporate rebranding. 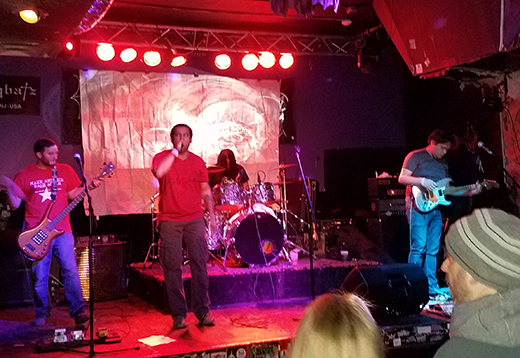 The fourth song, “Pop Tart” is boiled frantic rant about a landlord dispute. There’s no doubt that this “power trio” is punk rock. Bass, drums, and distorted guitar prevail throughout, and all the songs clock in at under three minutes. But these songs are not all three-chord-wonders; there are chord changes galore, and unexpected patterns. There are rhythms and melodies in the music that hint at other genres as well. There’s a swing factor in there. Pogo punk? Mostly not. Thrash-around-and-exorcise-your-latest-demons punk? Definitely.